FULTON, NY – Need medical care but don’t have the time for a scheduled doctor’s appointment? For patients of Oswego County Opportunities (OCO) Health Centers that’s no longer a concern. 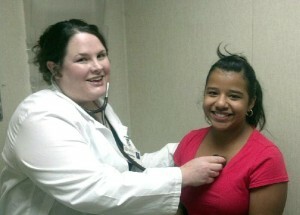 OCO recently established Walk-In Clinics at both its Oswego and Fulton Health Centers. Dr. Samantha Sheggrud, PA with OCO Health Services, provides treatment for Mardivina Escalante at OCO’s new Walk-In Clinic. According to Tricia Clark, Director of Practice Operations for the OCO Health Centers, OCO’s Walk-In Clinics all but eliminate the need for OCO patients to make doctor’s appointments and unnecessary visits to the emergency room seeking treatment for acute illnesses or minor injuries. “OCO health providers at our Walk-In Clinics provide a wide range of care when medical conditions require prompt attention and there is no immediate, serious threat to health or life. A visit to one of our Walk-In Clinics is the perfect alternative to going to urgent care or the emergency room. It’s a quick and easy way for our patients to receive medical treatment for acute illnesses and minor injuries without interfering with work schedules or other demands on their time,” explained Clark. Based on the number of people they have served in the three and a half months they have been open, OCO’s Walk-In Clinics in Fulton and Oswego have been a welcome addition to the medical community. “We have had hundreds of patients take advantage of our Walk-In Clinics. They have told us how they appreciate being able to access medical treatment for acute illnesses and minor injuries when they need it rather than waiting for a doctor’s appointment or sitting in an emergency room waiting area,” added Penny Halstead of OCO Health Services. Halstead added that while the Walk-In Clinics are accessible to current OCO patients, OCO Health Centers gladly accept new patients. “OCO Health Centers offer a full range of primary care services for the whole family and participate with most health insurance plans, making services offered at our Health Centers available to most individuals who are looking for quality health care from skilled, medical professionals. Some services are offered at a sliding fee scale, making them affordable to most individuals. In addition, OCO Health Centers accept Medicaid and Medicaid Managed Care, and our Facilitated Enrollment program can help families and individuals apply to receive the medical insurance they need,” said Halstead. OCO Walk-In Clinics are open Monday and Friday, 8 to 10 a.m., at OCO’s Fulton Health Center, 522 S. Fourth St., Fulton; and Tuesday and Wednesday from 8 to 10 a.m. at OCO’s Oswego Health Center, 10 George St., Oswego. For more information on OCO’s Walk-In Clinics, contact Halstead at 315-592-0721.